Cardiff Devils boss Todd Kelman is confident of regularly attracting an extra 1,000-plus fans to make a success of a new £16m Cardiff Bay venue which opens in August, 2015. Kelman says the Devils' crowds are up by around 45% on 2013-14. While battling to fourth in the Elite League table, Devils have drawn an average 2,000-plus, he says. "I don't think adding another 1,000 fans is going to be that difficult for us," said Kelman. The Devils have used the temporary and distinctive "Big Blue Tent" in Cardiff Bay since the original city centre ice rink was demolished. "It's going to bring curling to south Wales for the first time and it's going to double the opportunities for ice time for figure skating, for public skating and for ice hockey." It closed in 2006 to make way for a shopping centre development. Kelman, a Canadian who played in defence, arrived in Cardiff in June after leaving his job as Belfast Giants general manager to become Devils' managing director. Under new player-coach Andrew Lord, the Devils have begun to rekindle memories of what Kelman describes as their time as "the envy of the league for years in the '90s". Former Giants and Bracknell Bees player Kelman, 39, believes the rink development, part of a long-term plan to establish an international sports village in the Cardiff Bay area, is playing its part in the Devils' on-ice efforts. They have won 14 of 23 games this season and beat second-placed Braehead at the weekend to maintain their title challenge, having lost to third-placed Nottingham Panthers two days earlier. Kelman said: "I think the guys that are on this year's team understand what's the future here in Cardiff and the opportunity to be part of something game-changing, really because that's exactly the way we're describing this building. "It's a total game-changer, not just for the Devils, but for Cardiff as a venue, as a city for sport. "And it's interesting. There's two pads [rinks]. 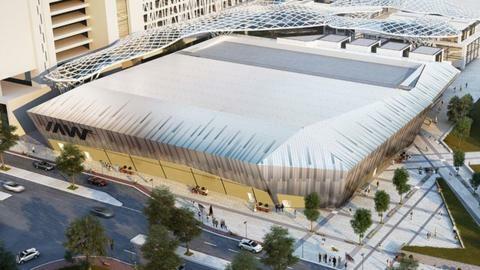 It'll probably be one of the busiest ice facilities in the UK. Around 3,100 fans will be able to watch Devils' home games and Kelman believes the new venue will itself help generate fresh interest in their progress. He said: "We changed the whole ethos of the Devils and we wanted to bring this… this franchise and this team was the envy of the league for years in the '90s and we wanted to make sure that we brought that back and I think we're doing that. "I think it's going to have the effect of a new building always brings new people back to see the new facility. "So I don't think adding another 1,000 fans is going to be that difficult for us, especially if we can keep it going the way things are going now. "There's a lot of positive energy around the club and we are doing well. "We are sitting in fourth place, just a couple of points off first place. "Everything is moving in the right direction, especially with the new facility coming on board." Kelman also believes the Devils will continue to draw support from beyond Cardiff. "We have people who drive two hours to every home game; people from all over the country. "The majority of people are probably from the greater Cardiff area, within Cardiff and the 20 miles surrounding it. "I hate to say it, my Welsh geography isn't tip-top. I've only been here a couple of months. "But there's people that drive in from Brecon… there's people from all over the place. "With the new facility this whole idea of the international sports village is really coming to fruition now and it's become a real destination and it's going to continue for years to come."